Here it is! The completed "Polar Medallion Quilt". I love all the colors so I particularly enjoyed working on this quilt! And it was a joy to quilt. 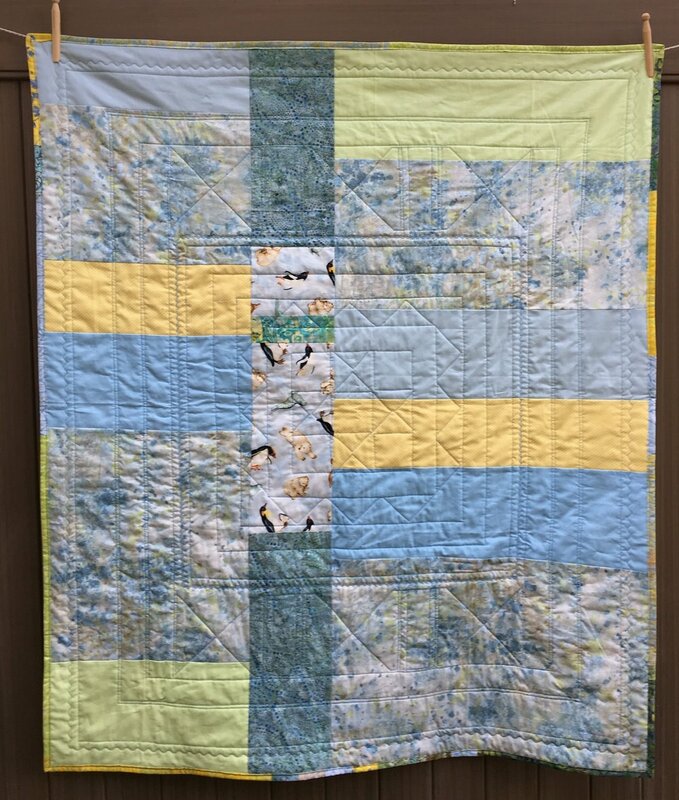 I did some straight line quilting, some echo quilting, a bit of embroidery on one of the solid concentric inner borders and I used my favorite Bernina #4 stitch in the last border. Here's the back of this quilt. You can see the quilting much more clearly on this side as well as the structure of the medallion. I hope you enjoyed following along with the making of this quilt. If you make one for yourself, please let me know! In my last post, I mentioned that I would tell you about two medallion quilt books. One is available now, the other is scheduled for release 12/26/2017. The Modern Medallion Workbook by Janice Zeller Ryan and Beth Vassalo was published by Stash Books in 2015. The book has a couple relatively simple medallion quilts but most of the quilts are complex, visually very exciting and look fairly challenging to make. I really like the quilt shown on the right side of the book's cover shown above. It looks like a party! The round flying geese medallion shown in the lower left corner above is incredible. It's the center medallion of a bright, fun quilt. It's an amazing book, but not one for a beginner quilter. The book coming out in December is being published by Lucky Spool. Make Your Own Medallion: Mix + Match Block and Borders to Build Your Quilt From the Center Out was written by Erin Burke Harris. The preview states she has created a variety of borders that can be made in 3 widths, as well as 6 center medallions that are ready for use. She has done all the math for the borders! Quilt Math is what makes designing a medallion quilt challenging. Here is a link to some page spreads photos from the book on the Lucky Spool website. I'm so intrigued. I can't wait to see this book! I hope I've sparked your interest in medallion quilts and that you'll try making one at some point. They are fun to sew and make beautiful and interesting quilts.